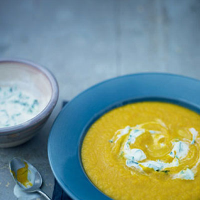 Raita adds a creaminess to this delicious spiced soup. Put the butter and oil in a saucepan on a medium heat. Add the onion, celery and carrots, stirring them around and getting a bit of colour on them. Then add the garlic, ginger and cumin and cook for another couple of minutes. Add the stock, season and bring to the boil. Turn the heat down to a simmer and cook for about 20 minutes until the carrots are completely tender. Leave to cool while you make the raita. Cut the cucumber lengthways; with a teaspoon, scoop out the seeds and discard. Chop the flesh and mix with the yogurt, garlic and mint, then season. Roughly blend the soup using a food processor or stick blender; season to taste. Serve with some raita spooned onto each bowlful.